Long-time readers may remember my first financial lesson came from the rough-and-tumble suburban streets in North Carolina on a hot summer’s morning. To make all my journalism professors happy, I can condense an 800+ word story into a few sentences: As an enterprising seven-year-old, I set up a doughnut stand during my mother’s yard sale. My father backed my business by fronting the money for supplies. After I sold out and made a nice little profit, he shocked me by taking part of my funds to cover the start up cost as well as pay my younger sister for being an employee. 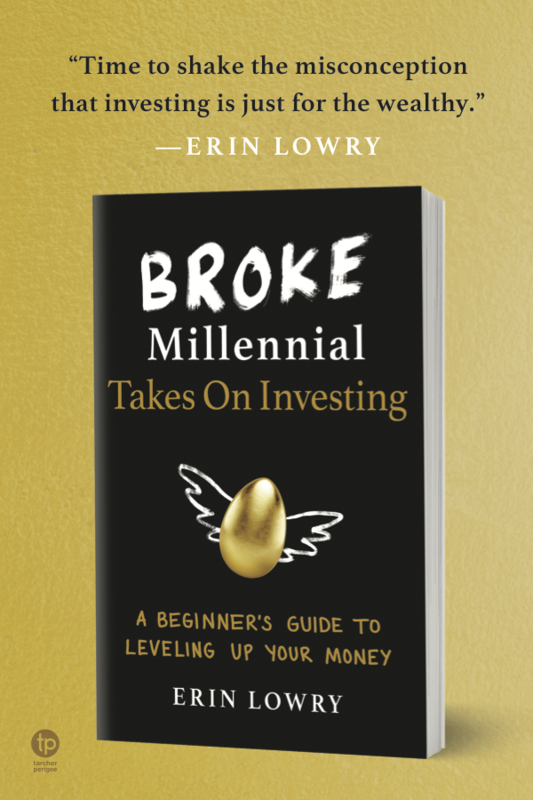 This moment started a lifelong quest to understand money: how to make it, how to save it and how to invest it. Betraying over-indulged millennials everywhere, I’m a strong advocate for tough love, especially when it comes to money. This is one of the many reasons I’ve always been enamored with Shannon Ryan of The Heavy Purse. 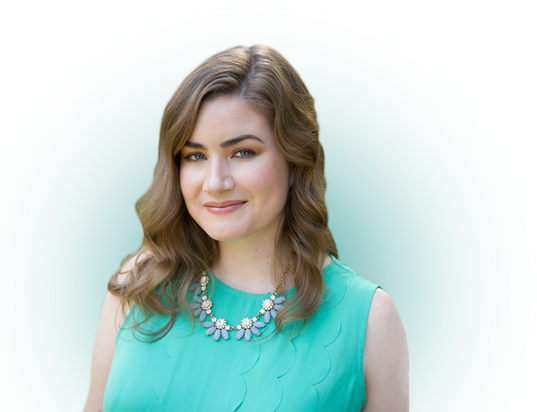 Shannon, herself a graduate of tough-financial-love school, is a force to be reckoned with in the field of financial literacy. She’s truly passionate about teaching children (her own and others) to understand money and helping parents learn how to create a financially literate generation. 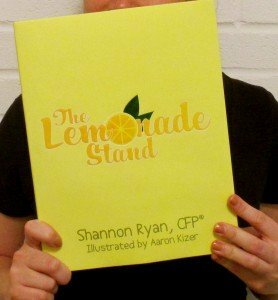 She recently came out with a children’s book called The Lemonade Stand to help explain financial concepts like net profit, charitable giving, saving, budgeting and fairly distributing profits. Much like my Dad, Shannon didn’t shy away from teaching her kids how to handle money at a young age by treating them maturely. She too requires they pay her back for funding their entrepreneurial endeavors. 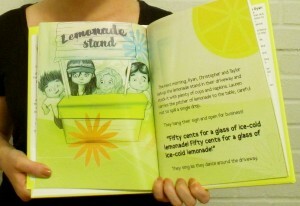 I started smiling as soon as I flipped the first page of The Lemonade Stand. My Dad would’ve loved to have a bedtime like this, instead of having to read Little Girls Wiser Than Men from The Book of Virtues for the millionth time (I had a feminist streak at a really young age). Shannon does a great job of simplifying basic financial concepts to make them accessible to kids, without dumbing down the content. I wouldn’t be surprised if this book creates a huge surge in lemonade stands summer. Hopefully the parents can handle fulfilling their part and taking money from their babies. I posed some questions to Shannon to get her take on how parents should handle talking to their kids about money and her true feelings on tough-love tactics. Did you have a hard time “taking money” from Lauren and Taylor [Shannon’s daughters] when you first taught them about net profit? Honestly, no. Does that make me a mean Mom? 🙂 In all seriousness, it didn’t because I have worked with so many people who left home ill-prepared to face the realities of earning and managing their money. And these were smart people who didn’t have an entitlement attitude and had very loving parents. But because money is taboo in so many homes, they had never been taught how to make good decisions with their money. Nor did they understand the long-term ramifications of their bad decisions. It was worth a few initial grumbles to teach my girls that in the real world, employee or business owner, you don’t get to keep everything you earn. How do other parents respond to the methods your using to teach your daughters financial responsibility? Overall, very well. It’s interesting because children and money is unfortunately an overlooked topic and missed opportunity for most parents. Whenever I speak at group settings, I have so many people approach me afterwards with a ton of questions because they now see the importance of teaching kids about money. And I love it when I get emails from parents telling me their children have their save, spend and share jars set-up. One young girl went to the bank to open her first savings account and the bank teller asked her what she does with her money. She said, “The 3 S’s, of course – save, spend and share!” LOVE it! What has been your proudest moment as a mom watching her daughters become financially responsible? There are so many! A couple that come to mind is how much my girls have embraced sharing. Lauren took to it right away, but Taylor did not want to share. I didn’t want to force her because I wanted her to love sharing and not see it as an obligation. After she experienced firsthand how good it felt to share through our family share goal and saw how much her big sister loves sharing, she was ready to try it. And now she loves sharing. I think we, as parents, sometimes overlook sharing, and it’s such an important mindset to develop in our kids. It definitely helps prevent that entitled mindset from forming too. I am also really proud of how much the girls love earning money. In fact, it is very rare these days for them to ask to buy them something they find at the store. Instead they ask me for more ways to earn money so they can buy it themselves. Music to my ears. How old should a child be when their parents parents should start teaching him or her lessons about money? I believe parents should start talking to their kids when they are toddlers, around 3 years old. Now this often surprises parents. I don’t think you should start talking to them about your investment portfolio, but toddlers, in particular, are watching and mimicking you, including how you handle money. They are very sensitive to your emotions and take your words very literally too. At this stage, it’s more about being a good financial role model and being mindful of your words and actions around money. Plus it also makes everyone comfortable with the topic of money and sets the stage for when they are older and those conversations deepen. Have your daughters’ understanding of finances ever surprised you? Absolutely! My girls overall love to talk about money, especially their goals, but they are kids. Some days I wonder if they understand all the things I talk to them about. And then, of course, that is when they surprise me with the depth of their understanding. I taught them to set goals that make their hearts happy and when we were on vacation last summer, we offered to buy the girls a little souvenir. They talked back and forth with each other and declined our offer to our surprise. Their reason – they liked the souvenir, but they didn’t LOVE it, and they wanted to wait until they found something they LOVED so the family money wouldn’t be wasted. They truly get and I am incredibly proud of them. 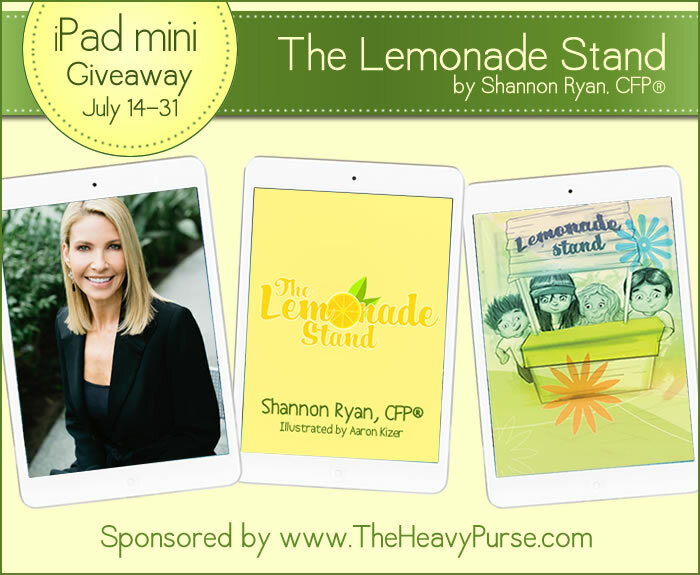 Hey Reader – Scroll down to find out how you could win an iPad mini! Co-hosted by Are Ya Gonna Eat That, Broke Millennial, Budget and The Beach, Budget Blonde, Budgeting for More, Busy Mom Budgets, Cash Cow Couple, Cents and Sensibility, Club Thrifty, Color Me Frugal, Debt Debs, Debt Roundup, Disease Called Debt, Eat Laugh Purr, Enemy of Debt, Eyes on the Dollar, Femme Frugality, Financially Blonde, Frugal Rules, Living Richly Cheaply, Luke 1428, Making Sense of Cents, Money Saving Dude, Monster Piggy Bank, Not Now Mom’s Busy, Reach Financial Independence, Shoeaholic No More, Stacking Benjamins, Tackling Our Debt, The Broke and Beautiful Life, The Finance Girl, The Frugal Farmer, The Random Path, Thrifty Dad, VeegMama, and Young Adult Money. We’re Giving Away an iPad Mini to One Lucky Reader! Help us celebrate the release of The Lemonade Stand and join Shannon in her mission to increase financial literacy in both children and adults. 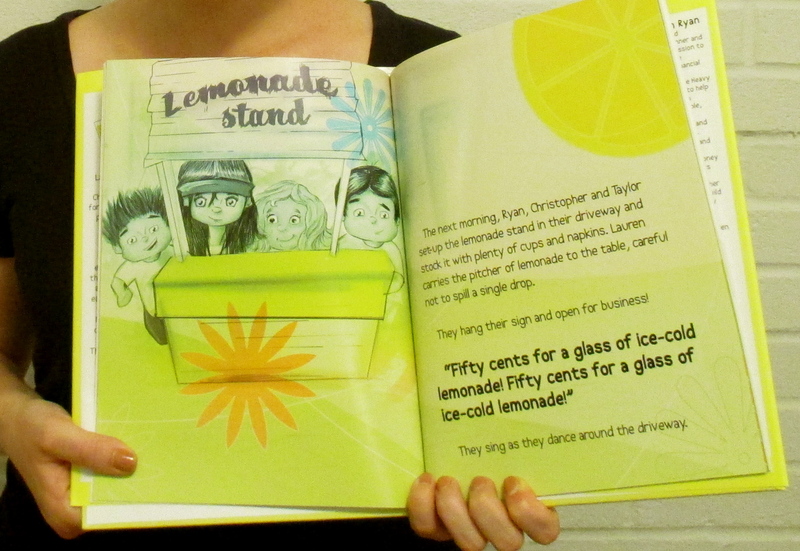 Broke Millenial readers can receive $3.00 off The Lemonade Stand with the coupon code TOUR3114. * A winner located outside of the United States will receive a cash equivalent prize via PayPal. So cute how they come to like sharing all in their own way. Great review, Erin! I think it’s great how Shannon integrated charitable giving into their financial lessons! It seems like the Lemonade Stand has swept the personal finance blog community…I’m seeing it everywhere. Great interview! Thanks, Josh. Just another perk of being such a tight-knit community. I’m glad to be supporting Shannon as a fellow PF blogger. Haha, you and me both. I love her commitment to using tough love that will make strong, independent women. I love Shannon’s book!!! =) Great giveaway! Thanks for your wonderful review, Erin! I’m so glad you enjoyed the book and I bet your Dad would have appreciated another bedtime story to read to you. Perhaps if he would have had this book back then, you wouldn’t have been so surprised when he made you pay for business costs. I guess Lauren and Taylor are partners so they split everything 50/50! As I already shared with you, I am so proud of how well the girls have embraced sharing. It really makes me so proud when I see them eager to help others. I hope they never lose that mindset! Thanks again for your support! Thanks for including me in the giveaway and for allowing me to interview you. I hope the book takes off like crazy! Great review and interview…I am very thankful for Shannon’s blog and books. I think teaching kids to be financially literate is very important but not something I know how to do well. My son just turned one so I still have a little more time to learn…but I can’t wait to employ the lessons Shannon used to teach her girls. And it makes great bedtime reading material! Great interview! I agree that you should start teaching your kids early about personal finance. I was never taught the value of money when I was young, but I knew that I don’t want to struggle like my parents did. Children certainly do learn a lot by example, even a negative one. It can encourage them to swing a 180 away from how their parents functioned. Love this posting. It is so Important to speak with children about $ at an early age. Don’t worry though if it takes quite a long while for them to get it. We started the 3 jars 2 yrs ago for our daughter, now 5 yrs old, and she is really just starting to ” get it” now. Don’t give up! These lessons take time.